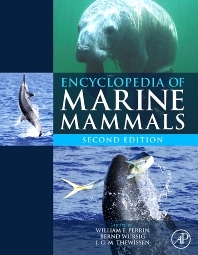 This thorough revision of the classic Encyclopedia of Marine Mammals brings this authoritative book right up-to-date. Articles describe every species in detail, based on the very latest taxonomy, and a host of biological, ecological and sociological aspects relating to marine mammals. The latest information on the biology, ecology, anatomy, behavior and interactions with man is provided by a cast of expert authors – all presented in such detail and clarity to support both marine mammal specialists and the serious naturalist. Fully referenced throughout and with a fresh selection of the best color photographs available, the long-awaited second edition remains at the forefront as the go-to reference on marine mammals. Marine Biologists, Ecologists, Conservation Biologists, Fisheries Biologists and Environmental consultants. J. G. M. ‘Hans’ Thewissen studies the evolution, anatomy and embryology of marine mammals, and has traveled the world to study fossil and living whales. Working in Pakistan and India, he discovered some of the earliest, amphibious, cetaceans and sirenians. His work with the sense organs of modern whales explores the impact of global change on marine mammal populations. A native of the Netherlands, he holds degrees in biology and geology from the University of Utrecht and the University of Michigan and teaches anatomy and embryology to medical students at Northeast Ohio Medical University. He also has appointments at Kent State University and the Cleveland Museum of Natural History. Wonderfully informative though some articles show the bias of the writer rather than full information. While I realize that the contents page is topic specific, an index would have been useful to find specific information.